Miguel O' Hara awakens in a laboratory manned by robots who attempt to probe him for signs of infection. As he tries to escape, he finds that Xina is the one who rescued him from the contaminated zone. She reveals that he washed up on the shores of the Fatherland, a place where scientists are working around the clock to find a cure to the techno-organic virus which is attacking humanity. She explains she was called to this place by the All Father. Doom, the All Father, observes Miguel and Xina. He is then interrupted by the Emissary of the aliens who have invaded. The Emissary reminds Doom of their agreement, he must deliver to them their scouts or face the consequences. 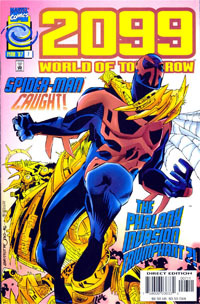 Miguel dons his Spider-Man costume and searches the contaminated zone for Wulf and Uproar who were separated from him earlier. He is horrified by all the bodies which litter the zone. Avian and Herod suddenly appear. The two have been transformed into techno-organic beings. They reveal that the bodies are of people who were infected on purpose as part of the All Father's experiments. 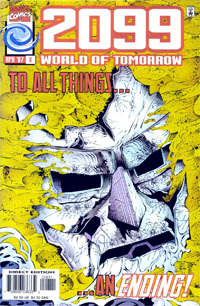 Miguel fights the two until Doom appears and reveals that he is the All Father. Doom explains to Miguel that he has agreed to help the aliens find their scout in order to buy time for he and the other scientists to break the Techno-Organic virus code and turn it against the invaders. He threatens Miguel with his brother Gabriel's life to force him to help the scientists with their work. Later, Xina visits Miguel to see how he is progressing. He explains that her research has already managed to shield humans from the virus but controlling it will be more difficult. Xina is confused by his comment and it becomes clear that Doom has not told Xina of his plan. Doom lurks behind them and becomes jealous of Xina's open regard for Miguel. Doom's thoughts are interrupted by the Emissary who reveals that they have had their eyes on the Scout since they arrived. At that very moment contact is being made and the Emissary reveals itself to be Magus of the Phalanx. Magus tells Doom and the others that the planetoid contains a legion of Phalanx embryos. To activate, all they need is the activation code buried in the Scout's genetic code. Once awake they will assimilate all of the planet's life forms and resources. Magus attempts to take Xina but is thwarted by Doom. Spider-Man joins the fight only for Doom to flee with Xina so that she can initiate Phase Two of his plan. Left alone to battle Magus, the alien tries to infect him with the Techno-Organic virus. The alien is surprised when he is unable to infect him because Miguel has coated his Spider-Man costume with the dampening agent thus making him impervious. Below the castle, Doom explains to Xina the next phase of his plan. 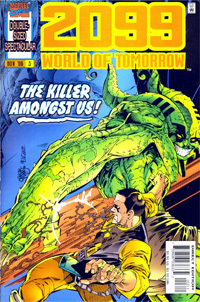 Because he is bonded to his armor via nano-technology he is vulnerable to attack from the techno-virus and a liability. 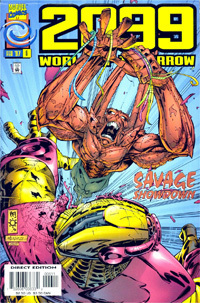 Doom instructs her to infect him and his armor and then use the techniques she perfected to purge the virus and the nano-machines out of his body. Miguel enters the lab as the procedure is overloading. 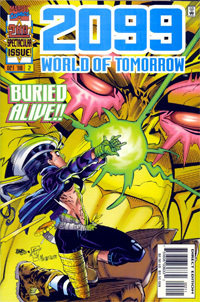 Xina fears that Doom will die from the procedure and begs him to stop it. Miguel breaks the device to shut it down. The process Doom undergoes here undoes the procedure he underwent in Doom 2099 #1. With the Scout located, the Phalanx begin the mass assimilation of the Latverian population. Deep below Castle Doom, Doom emerges from Xina's techno-organic procedure purged of the virus and the nano-machines which once bonded him to his armor. Doom must now prevent the Phalanx from activating the Scout. The Phalanx are using his castle as their base so he knows that the Scout will be brought there. Xina and Miguel accompany Doom to the lowest levels of the Castle. There Magus receives the mutant Nostromo who is in fact the Scout. The three together fight to prevent his activation but with no success, Nostromo is plugged into The Phalanx's massive world engine. 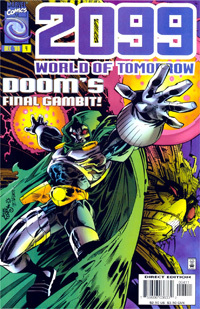 After the nano-machines are purged from his armor, Doom (inexplicably) appears in his 'classic' Doctor Doom armor, complete with gun and holster. 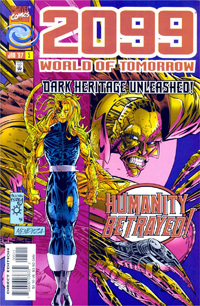 He has not worn this armor since it was all but destroyed in his first encounter with Tiger Wylde in Doom 2099 #1. The Phalanx assimilation of Earth begins. 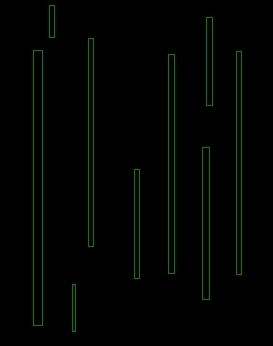 Nostromo has been connected to the World Engine. Heroes at the Last Refuge begin to repel attacks by Phalanx warriors. In the midst of battle, Spider-Man attempts to free Nostromo from the Phalanx's grasp, an act that Doom condemns. This, among many other actions, lead Xina to believe that Doom is a traitor. When Doom asks her to follow him, she dismisses him and continues at Spider-Man's side. Doom and Spider-Man with Xina flee the battlefield separately. Once alone, Xina convinces Spider-Man that the only way to beat the Phalanx is to kill Nostromo. From a mountain top, Doom observes as the Phalanx slowly assimilate his homeland. After sharing a few words with a fellow Latverian he flies off. Meanwhile, Spider-Man prepares to kill Nostromo in an attempt to end the invasion, however Doom arrives in time to stay his hand. Doom states that the Latverian border has been restored, and for that he will allow them one chance to leave, or else. The Phalanx, confident that he has an empty bluff, refuse. The aliens capture Doom and argue that human frailty will never defeat the collective consciousness of the Phalanx. Doom affirms that the collective lack the human spirit, to which the aliens answer by calling him a hypocrite for Doom has spent his life hiding in a machine. The Phalanx then rip Doom's armor off. Supposedly defenseless, Doom then plays his final card by activating a subroutine program hidden inside Nostromo which begins to erase his original scout programming. As the Phalanx begin to self-destruct Spider-Man grabs hold of Nostromo and Xina and together they escape the castle. Doom remains to watch the Phalanx die as the castle erupts into flames. Doom states here that the Mutant Messiah was a myth he created in order to ferret out the Phalanx scout which he had lost track of. Doom is dead. Miguel and Xina search through the rubble to find his remains but only find small pieces of his armor and face plate. Doom's last will and testament is played out by an interactive hologram which Doom prepared in the event of his death. In it he outlines the steps that Latveria should take in order to rebuild itself as well as announcing Nostromo as his heir. Dimitri is the "leader of the gypsies". One can only assume that the writers meant the Zefiro tribe which Doom belonged to. Fortune who was on the tribal council, is no where to be seen. Doom's holographic message declares Nostromo his heir.